The New Year is here. Are you ready for it? Have you written our your Resolutions and Goals? I’m a huge believer that everything good in life begins with a set of written goals and action steps to get there. This is the personal GPS system that turns your dream into reality. If you can distill the correct steps to accomplish something, and then follow them and measure your progress, you will ultimately always hit your goal. If you look at all of the greatest achievements of mankind, they all began with somebody doing more than just talking about it – they began with a written list of action steps. General George Patton once said “a good plan today is infinitely better than a great plan tomorrow” and that simply means you need to stop procrastinating and adopt a plan immediately so that you lose no time. Do you have your plan ready? If your New Year’s Resolution is to get into the billboard business in 2019 – and to create a second stream of income to give your financial stability – then the path is straightforward. Here’s what you need to do. You should not risk your investment capital in any concept that you do not fully understand. So you need to learn everything about billboards before you embark on that journey. You will need to understand about the Highway Beautification Act, state and local laws, how a ground lease works, how to sell the property owner on the concept, how to determine what size and height to build the sign, how to obtain the permit, how to rent the advertising space and how to maintain the structure and advertisement. Most billboard owners work a defined territory that is approximately a 5-hour circle from their home. This allows you to build signs, rent ad space, and monitor your assets within a simple drive to and from your residence. In many parts of America, this “circle” will take you into multiple states. quadrants (draw a vertical and horizontal line through it) and then rank these four sectors from highest amount of economic activity to least. Since billboards rely on businesses to advertise, you have to go where there are the most businesses. Look at which state or states your #1 quadrant falls into. You now need to contact the Department of Transportation in each of those and get a copy of their state billboard ordinances. This is typically a small brochure, or often it’s available online. Read and understand what it says. In addition, you may need to get an “outdoor advertising license” that gives you the ability to obtain permits there (typically just filling out a form). Now that you have the macro permitting process figured out, you will need to focus on the micro – and that’s the local sign ordinances. Billboards are regulated based on spacings (the distance between signs) and zonings. So to get in the business, all you need to know are these two pieces of information. Also of note is the maximum height and size that signs can be constructed, but that’s rarely a problem since most all cities and states allow roughly the same requirements. Since spacing between signs is simply a standard number (like 500 feet between each unit) the more complicated issue is the zonings. But this actually is not hard at all, thanks to something called “zoning maps” which are basically a roadmap showing the zoning of the land underneath. These come in rolls like blueprints. Take these zoning maps and highlight with a yellow highlighter all of the legal zonings for billboards wherever the land is bisected by the highway (the whole rest of the town is meaningless). You will soon see that you end up with a patchwork of yellow squares – and those are where the billboards can go. Now you are ready to get out into the field and check out these colored squares. What is located on them (businesses) and what are their street addresses? How close is the nearest existing billboard and does it meet the spacing requirements? This is your official list of all billboard targets. All you have to do to find a property owner in the U.S. is simply to take the address and put it into the property tax records of that county, which is easily found on-line in most markets. You can literally uncover 10 owners in 10 minutes or less. This information gives you the owner’s name and address, and you can supplement that with their phone number using an on-line directory like switchboard.com. Now you simply write them a letter and tell them that you propose to build a billboard on their property, and then follow that up with a phone call. Since this is effectively money for nothing (they have no time, effort or risk in the proposition) virtually all will be interested in talking with you. In person you give further discussion and then try to get them to sign your billboard lease right on the spot. In the billboard business, you always want to go as big as possible. So really what the sign owner has to determine is what type of structure to build. There are basically four types: 1) wooden 2) wall mount 3) steel I-beam and 4) steel monopole. Which you choose will be based on 1) what’s on the property and what you have to do not to bother that activity and 2) your budget. With a ground lease, the structure parameters and the exact location, you are ready to file for your permit. Assuming you did your homework on the front end, this is perhaps the easiest step. You simply fill out a form, enclose a small fee, and the permit arrives in the mail. You are now in business. Since you will contract the construction out, you have no time or effort in the actual building of the sign. Renting the ad space, however, is all on your shoulders. The good news is that there is an advertiser to fit every sign, and all you have to do is get the word out. You do that with a phone number on the sign, a direct mail piece, and calling the local businesses that the sign would work for. While finding the advertiser, make sure to look for who it will work for the best, as renewal is the key to happiness in billboard ad sales. In tandem with the completion of this billboard, you should have already moved on to the next. The beauty of the billboard business is that the time needed to manage signs is minuscule, so you can own and manage large portfolios without any employees and without interfering with your day job. Most owners only rent their signs once per year (thanks to 12-month ad leases being the norm). I’ve just given you the roadmap to building a sign from scratch. But there’s a much easier path, as well. And that’s simply to buy or take over an existing sign. You can find abandoned signs along most highways and these are already built so all you have to do is forge a new land lease (or adopt the old one) and rent the ad space. 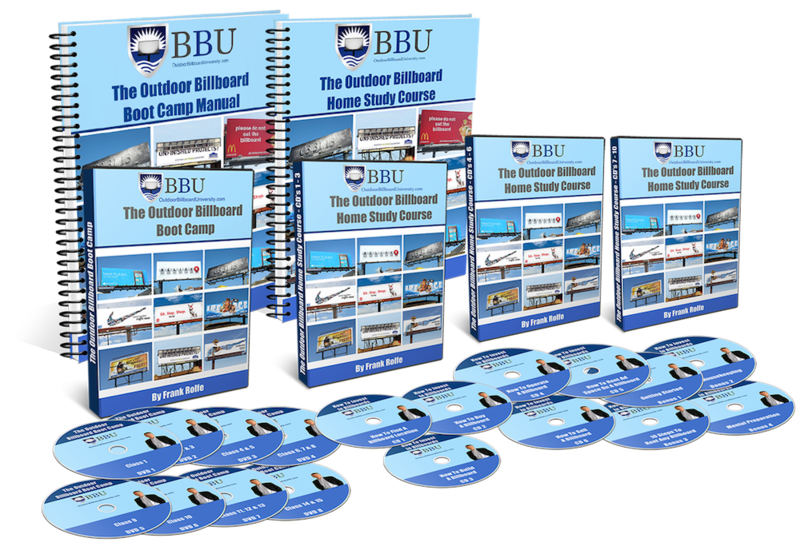 That’s the road map to making the billboard business a reality for you in 2019. All that’s holding you back is getting started. If you put in reasonable effort, you can complete all the steps and be out in the field looking at signs in 60 to 90 days. That gives you the rest of the year to start building your portfolio. Is This What Your Financial Safety Net Looks Like? Who would have thought that this is what financial security looks like? But it is for thousands of investors. 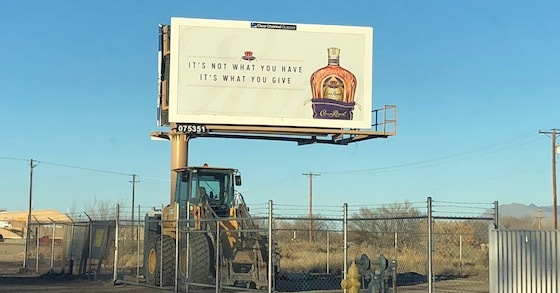 The simple billboard can produce a revenue stream that can support you in tough economic times, give you material advantages in good times, and allow you to build a fortune if that’s what your intent is. Let’s start with the potential financial impact of owning just one billboard, such as the one shown above. It’s a 12’ x 24’ “30-sheet” sign and it typically has a net income of around $5,000 to $10,000 per year. What could that do to your current economics? It might pay for your kid’s college, or that vacation to Atlantis. Or it might cover your mortgage or utilities. Five signs like this would be like having a second career, or making a two-income household out of one job. There are many people who have a small sign portfolio that generates $50,000 or so of net income. In many cases, that could even replace your day job. There’s a guy I know that lives across the Mississippi River in Illinois. He’s retired from the military and he’s been building signs for the past 20 years. He’s owns 100 of them. His are wooden signs and they net about $3,000 per year each – which makes his income from his sign “hobby” about $300,000 per year. How’s that for a hobby business? Clearly, once you get past a handful of signs, the impact of this type of income enhancement is immense. Billboards can totally change your financial future. They can be a supplement or a replacement to your existing day job. They can even become an empire. But it all starts with just one sign. Billboard rents have a unique feature: they almost always go up. Continuously. While other products go through cycles of pricing increases and declines, billboards are almost a continuous, gradual upward trajectory. Why is that? Billboard rents are based on traffic count. More cars equals more rent. And American traffic is always o the increase. 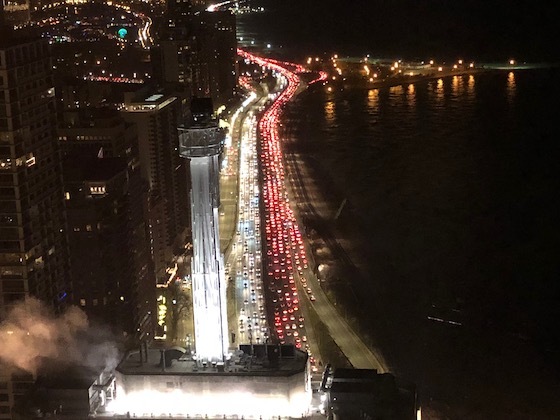 In some cities, such as Los Angeles, Denver, Dallas and Chicago, the gridlock is almost impossible to bear. But those traffic jams are desirable to advertisers because they yield more viewers and more time to read the ad messages. Billboards track other advertising rents. As other forms of media become more expensive, so do billboards. And, in general, ad revenues have been going up every year for decades. So in this manner, billboards are simply riding along on the coat tails of other media pricing. One of the biggest beneficiaries of the internet age has been the billboard business. The internet literally wiped out much of the competition when it comes to ad dollars. Television, magazines and newspapers were virtually eliminated by the new internet offerings, and this poured billions of dollars into other media. 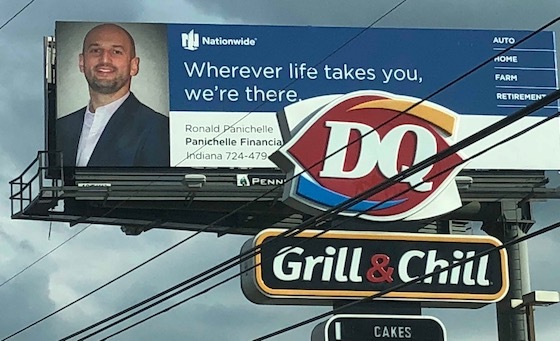 Meanwhile, billboards became more important as they are the only “point of purchase” advertising out there that can direct customers to take a certain exit to get to a certain business. New construction of businesses on the highway often necessitates the elimination of signs that stand in the way of new buildings. This creates a supply/demand aberration in which the actual supply decreases and the value of the remaining signs increases. Never forget that what made billboards valuable in the first place was the 1965 Highway Beautification Act which limited the supply of signs. Billboard rents are always going up. So are sign values. This is a product of the unique regulatory environment of the billboard industry, coupled with just sheer luck. There are many competitive features on roads that can block the visibility of billboards. They include power lines, trees, buildings, and other signs. So when is this blockage acceptable and when is it a real problem? not going to freak out if there’s something in the way at some point as the viewer sees the sign from their car. But they are also not going to be satisfied with a sign that cannot be clearly read by the customer due to an obstruction. 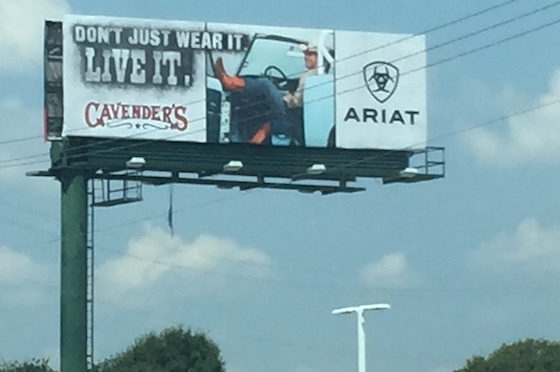 It’s generally accepted that billboards can only be clearly read in the final 500’ of view. At that point, the words on the sign are legible. So you can’t really have an obstruction in that final 500’ or you will get pushback from advertisers. But when the blockage is 3,000’ away – and you can’t even read the words – it doesn’t really matter. Can you remove the obstruction? The first thought any sign owner has when there’s an obstruction of their billboard is to ask “can I remove it?” And the answer is “maybe”. You’ll have to locate the owner of the property where the obstruction exists and see if there’s something you can do to make the problem go away. Maybe you can get the tree trimmed, or the flag lowered, or the Dairy Twin sign lowered a few feet – if you pay them some money. It’s always worth a try. Can you build around the obstruction? The other option is to potentially build the sign higher to get it above the obstruction, or to change its shape to make it narrower so that tree does not stand in front of it. But be careful here, as there are height limitations in many sign ordinances and if you don’t stick with standardized sign dimensions you may have difficulty in selling your billboard structure to another company down the road. Just because a sign has obstruction does not normally make it valueless – you just have to reduce the price to make it a good value for the advertiser. I once had to rent a sign that only had about 100’ of visibility – about 80% less than the norm. I got the job done by making the price too good to resist. Since I built this assumption into my budget on construction and land rent, it still made good money. Billboard obstructions are a fact of life. This list will get you on the right track.